In our series of letters from Africa, journalist-turned-barrister Brian Hungwe looks at Zimbabwe’s election fallout. The maxim that there are no permanent friends in politics has never been truer than in Zimbabwe, where historic elections took place last week. The polls were the first without Robert Mugabe – the man who has dominated politics since the country gained independence in 1980 and who at the age of 93 was unceremoniously ousted from power in November. His downfall was partly because of his attempt to foist his wife, Grace Mugabe, to higher office through Zanu-PF, which one faction of the ruling party – and some army generals – could not stomach. His expulsion from power and party led Mr Mugabe to have an ideological change of heart. The day before last Monday’s election, he urged people to abandon the “undemocratic” Zanu-PF, the party he helped set up 55 years ago, and to back the opposition Movement of Democratic Change (MDC) Alliance. It was never imaginable, not for a single day, that I would live to see Mr Mugabe voting for the MDC. In office, he consistently attacked the MDC as a puppet of the West, saying it was created to reverse the revolutionary gains of our independence and preserve the interests of white people on the commercial farms that he had grabbed in violent seizures. At many of his campaign rallies in the last decade and half, he branded whoever crossed the floor as a shameful sell-out. But what struck me most as Mr Mugabe slouched in his chair at his upmarket residence in the capital, Harare, addressing the world’s media, was his use of the word “undemocratic”. His regime’s brutal crackdown on the opposition has been well documented – with photos to show how opponents were dealt with. One of those who suffered was current MDC Alliance leader Nelson Chamisa. He was on his way to a European Union meeting in Brussels in March 2007 when he was beaten up by state agents and left for dead at the airport. Eight days before this, then MDC leader, Morgan Tsvangirai, and 50 senior party leaders had been barred from attending a prayer rally. They too had been beaten, prompting the regional body, the Southern African Development Community (Sadc) to intervene. 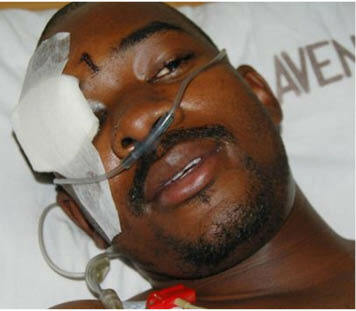 While lying helplessly on his hospital bed, Mr Chamisa said in an interview that he was paying the price for fighting for democracy. Now the very man who had wanted him dead gave him his vote in the just ended election. If Mr Mugabe had had his way, he would have stood against the 40-year-old Mr Chamisa as, until the military intervention which led to the nonagenarian’s removal from power, Zanu-PF had declared him their candidate for the 2018 election. And while Mr Mugabe was endorsing his former enemy, the same white farmers that he reviled were in their hundreds at Borrowdale Race Course in Harare embracing his successor Emmerson Mnangagwa, a Zanu-PF stalwart who was once Mr Mugabe’s right-hand man. It was another illustration of how dramatically the political landscape has changed. It would have been understandable for those former white farmers to stick with the MDC. But they now see their political interests safer with Mr Mnangagwa, who has promised 99-year leases to those who want to return to farming. As the election dust settles – with the victory of Mr Mnangagwa being challenged by the MDC Alliance – Mr Mugabe’s decision to give his vote to Mr Chamisa is now a source of debate. Did it add or subtract to Mr Chamisa’s political fortunes? There has even been speculation that Mr Mugabe funded the opposition – something that has led to divisions within the MDC Alliance. Mr Chamisa has shrugged off such criticism, saying after the election that one vote did not make Mr Mugabe an ally. “Don’t victimise Mr Mugabe for voting for a candidate of his choice, it is his right as a citizen. I thank him if he voted for me,” he added. The MDC Alliance leader alleges that Zanu-PF rigging lost him the presidential election – by inflating numbers in some areas, something the ruling party denies. However, top MDC official Douglas Mwonzora believes it was Mr Mugabe who cost the party votes in an election some say was the most fair since 1980. “My opposition to Mugabe is known in the party. I did not like Mugabe. I have opposed working with him. I think Mugabe is a kiss of death,” he told the state-run Herald newspaper. Whatever Mr Mugabe’s true relationship with the MDC Alliance is, electoral expert Tarisai Mutangi says his comments on the day before the polls, when campaigning was barred, cannot be ignored. Now Mr Mugabe may even be regretting his choice as he is still without friends in the corridors of powers. He revealed that he has yet to receive a pension worth $467,000 (£367,000) from the government and that his mansion in Borrowdale Brooke is leaking and needs renovations. As a voter I have learnt one thing from this election – never trust a politician. They have few, if any, principles.